Real Business Solutions has announced the release of its small-business payroll software that makes adding employees to payroll simple and inexpensive. The $99 package supports the payrolls for up to 10 companies, employing up to 75 employees apiece, for one year. Payroll Mate integrates with accounting applications including QuickBooks, Peachtree, Sage 50, Sage 100, Intuit Quicken, Microsoft Dynamics, Xero, Microsoft Accounting, and other leading software. The desktop-based solution gives ownership of the software and data to each user and provides free technical support via phone, email, or live chat. The platform ships with a powerful data-import engine for employee payroll setup and other data, such as name and address. 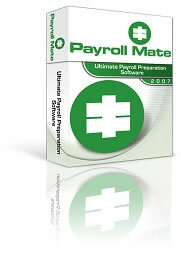 Data from payroll checks generated with Payroll Mate can be exported into most accounting systems. • Calculates federal and state payroll tax withholdings automatically. • Supports weekly, bi-weekly, semi-monthly, and monthly pay periods. • Supports customizable categories, such as payroll income, taxes, and deductions. • Exports payroll data to most major accounting software platforms. • Supports payroll vacation and sick-pay accrual. • Supports all federal payroll forms and many state forms. • Prints forms IRS 1099 and 1096. • Supports income per mile and per piece. • Exports reports to Excel, CSV, and PDF. • Prints on laser and inkjet checks. • Generates reports such as payroll journals, tax liability, and deposit requirements. • Generates direct deposit files. • Prints MICR checks on blank-check stock.